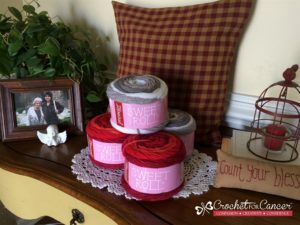 Premier’s Sweet Roll Yarn – “Oh How Sweet It Is” - Crochet for Cancer, Inc. I was given a few rolls of Premier’s new Sweet Roll acrylic yarn to try and let me tell ya, it’s sweet!! When you make a handmade item for someone fighting cancer you not only have to look at what the yarn or material is made of but how soft it is. Especially if you are crocheting or knitting a chemo cap. Tender heads need soft caps and because many people have allergies to wool, it’s best to use either cotton, acrylic, polyester or a blend. Premier’s new Sweet Roll definitely hits the mark. It’s 100% acrylic medium weight yarn and very soft. Plus they are super cute, easy to stack, machine washable, and with their 3 changing colors in long sections, they are simple to use. Each roll has 3 colors that are repeated one time throughout the ball. As you can see in the basic double crochet cap I made earlier today, it automatically creates sections of color for you. No need to tie in another color and then have to weave in the extra ends. Premier has done the work for you. I also love the color combinations. 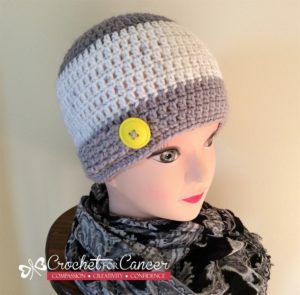 The yarn color in this cap is called Silver Swirl. To add a little pop of color I added a strap that attaches to the yellow button. Overall I am really happy with this yarn. It was sturdy yet soft which is perfect in making caps for cancer fighters. I found that I can make 2-3 caps per Sweet Roll. I’ll definitely be using this yarn in the future. Order your Sweet Roll today at Premier Yarn’s. Now thru October 31, 2016 receive additional 10% OFF your order using Coupon Code SWEET10.